We hope that you’re doing well and participating in whatever way that you can to raise awareness for prostate cancer throughout September – Prostate Cancer Awareness Month. We’re pleased to provide you with some of the latest Prostate Cancer News You Can Use. Below you’ll find titles of recent articles followed by a link to the Us TOO web page that provides access to the full text. The 13 th Annual SEA Blue Chicago Prostate Cancer Walk & Run on Sunday, September 10 th proved to be a great opportunity for raising awareness for prostate cancer and funds to help Us TOO provide educational resources and support services to the prostate cancer community at no charge. We extend our sincere thanks to all sponsors, walkers, runners, volunteers, fundraisers, donors, event co-presenter UroPartners, and Us TOO Board of Directors. Donations will be accepted through October 31 st. While we were thankful to have a beautiful day of sunshine and blue skies for SEA Blue, our thoughts and prayers were with, and continue to be with, those affected by the hurricanes in Florida and Houston, along with others battling forest fires in the West. The 3rd Annual SEA Blue Ribbon Walk in Rochester, NY , on Saturday, August 19, was a success once again! We thank support group leader Patrick Fisher and his team of organizers, volunteers, sponsors and participants for raising awareness and funding for prostate cancer S upport, E ducation, and A dvocacy provided by Us TOO. An investigational clinical study of Focal MR-Guided Focused Ultrasound Treatment of Localized Intermediate Risk Prostate Lesions is currently enrolling men with Gleason 7 prostate cancer. Learn more about the PCa003 Study. Patient Access Network Foundation (PAN) is conducting a survey to learn more about the financial assistance patients may need to cover the out-of-pocket costs of medications, and the challenges patients face when looking for financial assistance. The survey takes about 5 minutes to complete and will be open through Friday, September 29, 2017. Local researcher: Why are black patients more likely to get, die from prostate cancer? 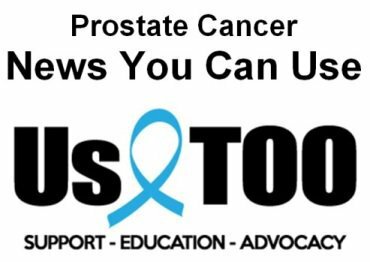 We’ll be sending the October issue of the Hot SHEET newsletter from Us TOO in about two weeks and more of the latest prostate cancer News You Can Use in about one month.